A rhyme occurs when two or more words have similar sounds. Typically, this happens at the end of the words, but this isn't always the case. Assonant rhyme - This is the rhyming of vowels in words but with different consonants. It is sometimes referred to as a slant rhyme. Examples include tip and limp, dank and bat, bowl and home. Consonant rhyme - This is the rhyming of consonants but not vowels. Examples include bell and ball, dump and damp, meter and miter, mile and mole. Dactylic - This rhymes the third syllable from the end. One example is Aristophanes and cacophonies. Eye rhyme - The rhyming in this type is based on spelling and not sound. Examples are: move and love, cough and bough, food and good, death and wreath. Feminine rhyme - Also referred to as double, triple, multiple, extra-syllable, extended, this has different beginnings of the words, but rhymes latter syllables. Examples include backing and hacking, tricky and picky, moaning and groaning, generate and venerate. Head rhyme - Also called alliteration or initial rhyme, this has the same initial consonant at the beginning of the words. Examples are blue and blow, sun and sand, merry and monkey. Identical rhyme - This is rhyming a word with itself, but often refers to a different meaning. An example is in Emily Dickinson's "Because I Could not Stop for Death." Internal rhyme - The rhyming happens within a line of poetry. 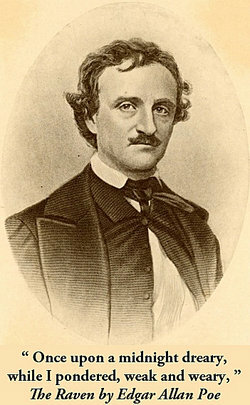 This example is from Edgar Allan Poe's "The Raven." Light rhyme - Rhyming of syllable where one is stressed and the other is not. Examples include frog and dialog, mat and combat. Macaronic rhyme - This rhymes words from different languages. Examples are villa and manilla, amore and favor, sure and kreatur, lay and lei, sitar and guitar. Masculine rhyme - In this rhyme, the stress in on the final syllable in both words. Examples include support and report, dime and sublime, divulge and bulge. Near rhyme - Also referred to as half, slant, approximate, off, and oblique, this rhymes the final consonants but not the vowels or initial consonants. Examples are bent and rant, quick and back. Oblique - This is an imperfect rhyme because the sounds do not quite match. Sometimes these are called half, approximate, near, off, or slant rhymes. Examples are lap and shape, fiend and mean, gun and thumb. Perfect rhyme - Sometimes called exact, full or true, this rhyme is the typical rhyme where the ending sounds match. Examples are cat and hat, egg and beg, ink and pink, boo and true, soap and dope. Rich rhyme - In this case, the words are pronounced the same but have different meanings, like homonyms. Examples include raise and raze, break and brake, vary and very, lessen and lesson. Scarce rhyme - This refers to words that have very few other words that rhyme with them. Examples are lips and whisp, oceanless and motionless. Semirhyme - In this rhyme, one word has and extra syllable. Examples are mend and ending, rye and buying, lick and pickle. Syllabic - Rhyming the last syllable, this is also called tail or end rhyme. Examples include beaver and silver, dancing and prancing. Wrenched rhyme - This is an imperfect rhyme which rhymes a stressed with an unstressed syllable. Examples are caring and wing, lady and a bee. Now you know all different types of rhymes. "Examples of Rhyme." YourDictionary, n.d. Web. 23 April 2019. <https://examples.yourdictionary.com/examples-of-rhyme.html>.